A maritime inspired wire frame encompasses a globe of clear seedy glass. Softly scalloped edges of the lanterns are cast of premium solid aluminum providing durability and stylish impact. This series is offered in an Burnt Bronze (BB) finish with subtle gold highlights. This outdoor pendant will update the exterior of your home with its eye-catching design. Featuring an oil rubbed bronze finish and clear seedy outside; matte opal inside shade(s), this fixture will accommodate a variety of outdoor of dicor styles. With its easy installation and low upkeep requirements, this outdoor pendant will not disappoint. This outdoor pendant will update the exterior of your home with its eye-catching design. Featuring a bronze finish and clear water glass shade(s), this fixture will accommodate a variety of outdoor of dicor styles. With its easy installation and low upkeep requirements, this outdoor pendant will not disappoint. Update your space with Globe Electric's Charlie Collection. The bronze colour and oil rubbed finish enhances your space while the clear seeded glass shade makes sure your area is bright. Shining with the brightness of a 60-watt incandescent bulb, this included LED bulb uses only 7 watts of power saving you money in electricity costs. With a 2200 kelvin colour temperature, this fixture emits a soft white light that is easy on the eyes. Completely dimmable with a compatible dimmer switch, you can create the lighting mood and ambiance you desire (dimmer switch sold separately). Includes all mounting hardware for quick and easy installation and one 7-watt (60-watt equivalent) vintage Edison LED bulb. Complete your outdoor space with the Liam Collection by Globe Electric. Bronze with a brushed finish and frosted glass shade of the Liam Outdoor Pendant pair perfectly with a round connector and hanging chain to bring a charming coastal element to any space. The mesh detail completes the look. Perfect for any outdoor area, Globe's nautical Liam Pendant adds distinctive style anywhere you place it. Includes all mounting hardware for easy installation and requires one medium based B11-shape 60W max bulb (sold separately). 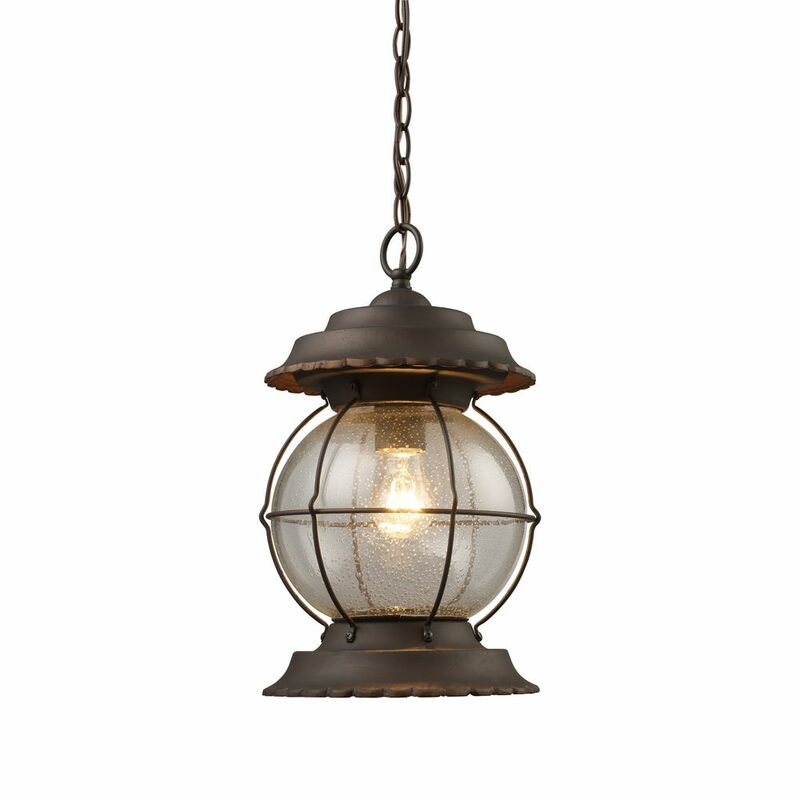 1 Light Ceiling Mount Burnt Bronze Outdoor Pendant A maritime inspired wire frame encompasses a globe of clear seedy glass. Softly scalloped edges of the lanterns are cast of premium solid aluminum providing durability and stylish impact. This series is offered in an Burnt Bronze (BB) finish with subtle gold highlights.